One of the sessions at news:rewired – media in motion will look at how newsgames and gaming mechanics are being used in journalism. Shannon Perkins, editor of interactive technologies at Wired.com and who created Cutthroat Capitalism, a game where the player puts themselves in the position of a Somali pirate, will be coming over from the US to speak at news:rewired. In a Journalism.co.uk podcast he said a reader should “develop a deeper sense of the underlying themes of a story” by playing a game. Another speaker presenting in the newsgames session at news:rewired is Bobby Schweizer, a doctoral student at the Georgia Institute of Technology and co-author of Newsgames: Journalism at Play. He will also be joining us from the US. Here is a list of 10 newsgames to give an idea of how games can be used in storytelling. This BBC interactive, which uses gaming mechanics, is proof that newsgames go viral. The world at seven billion was the most shared and “liked” news story on Facebook of 2011 with 339,149 shares, comments and likes. It was also the most clicked story on Facebook this year and was the fourth most popular news story on Twitter in 2011 with 73,783 tweets. A newsgame was also the second most popular news story on Facebook in 2011, with 219,023 shares, likes and comments. It is the Guardian quotes quiz where readers are asked to guess whether a line is a quote from former Libyan leader Muammar Gaddafi or actor Charlie Sheen. This one was “produced very quickly”, according to the Guardian, and is an idea that could inspire small news organisations without a budget for big game development. You are a pirate commander staked with $50,000 from local tribal leaders and other investors. Your job is to guide your pirate crew through raids in and around the Gulf of Aden, attack and capture a ship, and successfully negotiate a ransom. This newsgame is based on the rescue of the Chilean miners trapped underground in 2010. According to Bobby Schweizer, who will be speaking at news:rewired, the game, which asks the player to rescue the miner, provides an insight into the slow process involved in rescuing each miner. You perform the rescue 33 times if you want to finish the game – which is impossible really to complete. It’s trying to get across that concept that maybe you can’t explain in a written article. When you see video clips edited together of each of the miners returning to the surface you have three to five seconds of each of their faces, you don’t get that real sense of how long it actually took. The game was able to express that in the way that other stories couldn’t. This is a game produced by the Telegraph. It asks users to answer a series of questions to find their values and concerns. The game then cross-checks responses with party pledges and the player is then told how they should be voting. This game received much attention as voters were often surprised by the results the game returned. Perhaps the most widely used form of gaming mechanics used in news is the budget calculator. The viewer enters a salary, the fuel-type of their car, amount of alcohol units consumed per week and other details and then gets told how much better or worse off they will be based on the new budget. This budget calculator from the BBC shows gaming mechanics in online news is nothing new – going back at least 10 years. Here are BBC examples from 2002, 2003, 2004, 2005, 2007, 2008, 2009, 2010 and 2011. At the beginning of this year the Guardian produced an interactive based on the Monopoly board. By clicking on each retailer the player finds out how business faired last Christmas. PolitiFact also uses gaming mechanics, such as with its Obameter, which tracks the US President’s campaign promises, the Truth-O-Meter (which also comes in app form) to test politicians’ and the GOP Pledge-O-Meter to rank political promises. Speaking at the World Editors Forum in October founder and editor of the site Bill Adair said he felt there was “a tremendous lack of imagination” in the news industry in how to take advantage of new publishing platforms. It’s like we’ve been given a brand new canvas with this whole palette of colours and we’re only painting in grey. We need to bring all the other colours to this new canvas. US investigative news site ProPublica regularly uses gaming mechanics in news stories, such as with Dollars for Docs which enables people to find out whether their health professional has received money from drugs companies. Speaking at the World Editors Forum Scott Klein, editor of news applications, told the conference that as well as adding context, a news app has the ability to personalise and place the user at the centre of the story and offer them the ability to see the impact on them. “It doesn’t just tell a story, it tells your story,” he said. Here’s a budget puzzle from the New York Times. The reader is asked to work out where to make spending cuts to balance the books and hopefully get a sense of the financial challenges, tough decisions and the size of the shortfall. Want to find out more about newsgames? Book a ticket for news:rewired here. This is a cross-post from news:rewired. This entry was posted in Multimedia, Online Journalism and tagged BBC, Bobby Schweizer, gaming, news:rewired, newsgames, shannon perkins, Telegraph.co.uk, The Guardian on December 16, 2011 by Sarah Marshall. The Telegraph is is among the first websites to add Twitter’s new ‘follow’ button, which allows users to click and follow reporters or the newspaper’s Twitter account in a single click. More than 50 sites have added the follow button today, making it easy for you to discover the Twitter accounts of your favourite reporters, athletes, celebrities, and other personalities. Using the follow button is as simple as a single click. You can also see the profile and latest tweets of the account you want to follow by clicking the username next to the button. The Telegraph, the only UK newspaper to partner with Twitter for the launch, has added the new buttons to journalists’ pages, blogs and section pages such as news, sport and technology. The button is simple to add to news sites and blogs. Click here and copy and paste the embed code. This entry was posted in Handy tools and technology, Online Journalism, Social media and blogging, Traffic and tagged Telegraph.co.uk, Twitter on June 1, 2011 by Sarah Marshall. The paywall strategy makes sense for the Telegraph if its management believes two things. First, that the online news landscape is changing so that professional news – especially, perhaps, professional conservative newspaper journalism – becomes markedly scarcer online … Second, that the Telegraph’s current monetisation strategy – which is to attract a mass audience and show them display and search ads – is coming to an end. This entry was posted in Business, Editors' pick and tagged Business, paid content, pay wall, paywall, paywalls, telegraph, Telegraph Media Group, Telegraph.co.uk on December 1, 2010 by Laura Oliver. Cristina Odone, writing on Telegraph.co.uk, faced a commenter backlash when she wrote an article labelling Lib Dem MP Dr Evan Harris, “Dr Death”. Along with many perturbed commenters, Evan Harris challenged Odone’s factual evidence. Odone’s next step? To write a comment piece claiming she was “spooked” by the reaction, arguing “there’s no room in the Lib-Labs’ intolerant culture for discussion”. Many commenters, however, give a disclaimer that they are not Liberal Democrat. We recommend reading both pieces and sets of comments in full to judge the affair for yourself. This entry was posted in Editors' pick, Online Journalism, Social media and blogging and tagged Cristina Odone, evan harris, Liberal Democrat, Telegraph.co.uk on April 26, 2010 by Judith Townend. Telegraph.co.uk will move away from chasing high reader numbers online to focusing on “content, commerce and clubs”, says Edward Roussel, digital editor at the Telegraph, in this interview with PDA. With the realisation that high web traffic figures does not guarantee a sustainable business model, Roussel says the focus will now be on developing channels. Part of this will be the work of Project Euston, the Telegraph’s new digital entrepreneurial unit led by Will Lewis, which has now been up and running for three weeks. Euston is not a private club where only certain people can operate. It is designed openly. We have done it so that any one of our over 500 journalists who has a brilliant idea can apply for funding and other resource, and try to make it a reality. The channel strategy will focus on creating content and commercial opportunities, such as shops and clubs, around niche areas and PDA picks up on the site’s existing gardening section, which carries a shop and drives readers to buy. While there are opportunities to charge for access to certain areas, such as crosswords, by setting up clubs, Roussel adds that there are no immediate plans in place to go behind a universal paywall. This entry was posted in Editors' pick, Online Journalism, Traffic and tagged Crossword, Edward Roussel, paywall, paywalls, PDA, Telegraph.co.uk on February 4, 2010 by Laura Oliver. What? Former foreign correspondent for the Daily Telegraph newspaper, now editor of Telegraph.co.uk, in charge of the day-to-day running of the site. This entry was posted in Recommended journalists and tagged #followjourn, Daily Telegraph, editor, foreign correspondent, Marcus Warren, Telegraph.co.uk, the Daily Telegraph on September 23, 2009 by Donna Goddard. This quarter’s Nieman Reports, from the Nieman Foundation for Journalism at Harvard, has too many good articles in one place to select just one as an Editor’s Pick – so here’s a link to the whole index of pieces on journalism and social media. Lewis DVorkin on the rise of the entrepreneurial journalist. This entry was posted in Editors' pick, Online Journalism, Social media and blogging and tagged communities editor, editor, entrepreneurial journalist, Harvard, myreporter.com, Nieman Foundation, Nieman Foundation for Journalism, Nieman Reports, Shane Richmond, social media, Telegraph.co.uk, Vaughn Hagerty on September 17, 2009 by Laura Oliver. Fifty editorial jobs needed to be cut at Guardian News&Media as part of an attempt to reduce costs by £10 million, it was announced in May this year. Now it looks like there could be more jobs at risk, as the managing director of Guardian News & Media, Tim Brooks, told staff in a memo posted on the Guardian’s intranet. “We are looking at everything – literally everything – that we do, to see how we can economise, and we will do whatever we can to keep the impact on staff to a minimum. However, because the biggest portion of our costs is people’s salaries, we have to review staffing levels,” he said. GNM was losing £100,000 a day – a rate that cannot be afforded by its parent company, Guardian Media Group, Brooks said. This entry was posted in Editors' pick, Job losses, Jobs, Newspapers and tagged GBP, gnm, guardian, Guardian News, Guardian News&Media, Guardian.co.uk, job cuts, managing director, Telegraph.co.uk, The Guardian, tim brooks on September 16, 2009 by Judith Townend. But no: please take note of the last part. As both Journalism.co.uk and Fred Hatman, a journalist in South Africa found out, embed codes are only for ‘personal use’. That didn’t include Hatman (@fredhatman) even though he is a lone blogger. Instead, we had to feature the story of the Telegraph journalist who was attacked by a lion after willingly entering its enclosure (mauling received surprisingly cheerfully) without the accompanying video. We got permission to link though! 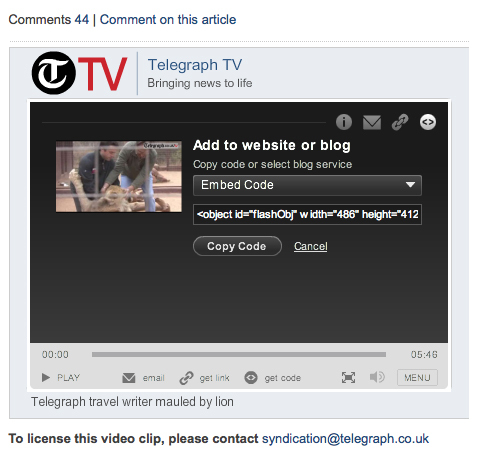 Journalism.co.uk wonders how Telegraph.co.uk will monitor and police misuse of the videos – if abuse was extensive. Or how they decide who is commercial and who is not? If, as the Syndication people tell us, ‘on this occasion Telegraph.co.uk are not offering this video for web syndication’ why bother supplying it at all? Isn’t that just asking for trouble? This entry was posted in Comment, Handy tools and technology, Online Journalism, Social media and blogging and tagged fred hatman, Journalism. co.uk, journalist, South Africa, syndication, telegraph tv, telegraph video, Telegraph.co.uk, the Telegraph, web syndication on September 11, 2009 by Judith Townend.